I think that heavy steering with big tires is why my early Rsport steering wheel was 15". Bigger than a standard 242gt or 240 turbo type wheel. I'm pretty sure it fit late 140 early 240 series. I sold it to Ian. It's over on your side of the country now. lol. Yeah, I've got a turbo wheel on mine as well. At least those cars had a rack in them though. Tyler's right, the steering boxes on these when paired with meaty tires lend to a VERY heavy wheel when not rolling. I've found the same on mine with 215/45's. Glad that TPS fix worked out! Mind throwing some pics of the fan setup in? I've gotta do a radiator in mine, been wanting to go e-fan for a while but there's virtually no room with the stock radiator. The fan isn't perfect, but it seems to move more air and is substantially quieter than the SPAL. I welded some quick brackets to mount it. If it ends up working better than the SPAL, I'll pull it off to clean up the shroud and powder coat it. It's very tight to my B23 water pump pulley. Obviously different than on your B20, and I don't have the stock radiator. The car is out of commission once again while I continue to chase T5 problems. I think I've made some progress with that, but I'll wait until the bell housing and adapter are back from the machine shop to be sure. In the meantime, I bought a turbo. I went back and forth for a couple months, and ended up deciding that I couldn't spend Garrett GT money on a turbo. I ended up getting an S252 SX-E, with an AGP t3 .48 turbine housing. This turbo flows more than I need, but it uses pretty modern compressor wheel tech, and should spool ok. Especially with the .48 housing. 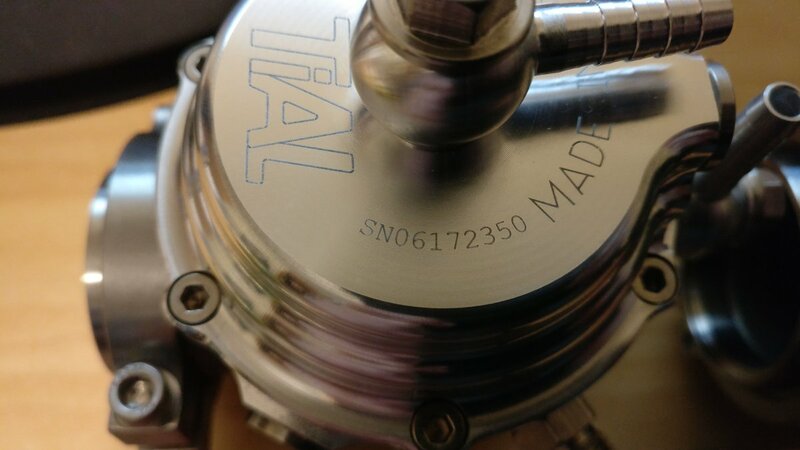 I plan to weld (have Noah weld) a Tial 38mm wastegate onto the turbine housing and dump it back into the downpipe. I just looked up the specs on that turbo; 70mm turbine wheel inducer diameter is quite a bit larger than the (edit) GT2871R or GT3071R turbos you were considering. Was that intentional or a byproduct of what was available in the power range you wanted? The S252 should be a 52mm inducer, 70mm exducer compressor. Which is right in the ball park of the gt3071r, right (53/71mm, if memory serves). edit: I see you were talking about the turbine wheel. Yeah, it's bigger and I would have gotten something smaller if it was available. I'm hoping the .48 housing helps it spool faster. That's a lot bigger. I'll be curious to see how it spools for you. 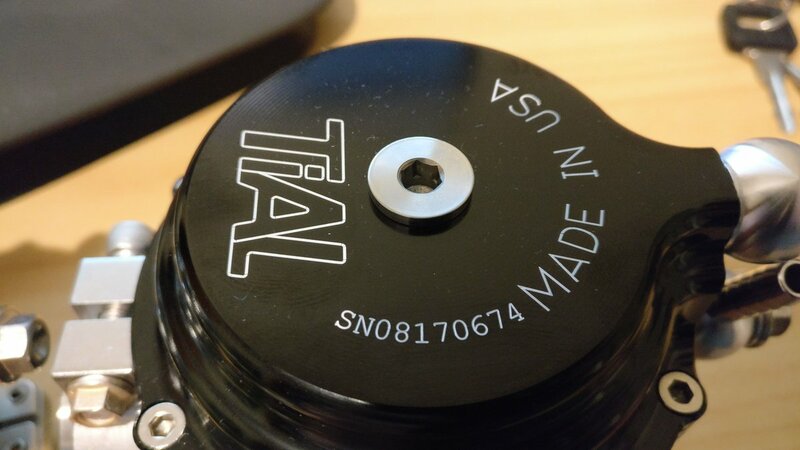 Is it T3 or T4 inlet? Last edited by t8fanning; 08-13-2018 at 05:18 PM.. I'm comparing turbine inducer (major diameter) which is apparently 70mm on the S252. GT30 and GTX30 inducer diameter is 60.00mm. Me too. It's a t3 inlet. Nice. I think it's a good move honestly. 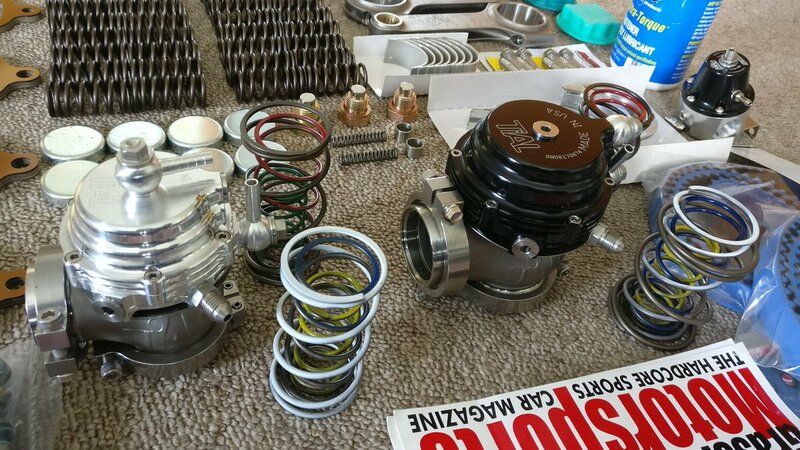 I've been too conservative in turbo sizing and it's annoying to try and sell to upgrade. So now I'm an advocate for getting as big a turbo as you can handle. That was kind of my thought process here. I feel like the small turbine housing will make this one liveable at lower power levels, for now. But if I ever want more (Big valve/ported head, 16v, or even a whiteblock), this turbo should be able to keep up. And it's $900 brand new. Good logic, even if I can't endorse the brand ( ) I can agree that you have a sound approach ( ). There are typically gains to be made by going with the largest available turbine. If the compressor wheel that matches your goals is available with a few different sizes of turbine wheels, and each of those have a few different housing A/Rs, then you can usually gain turbine efficiency and response by choosing the largest wheel with a smaller housing to achieve the same flow as one of the smaller wheels with a larger housing. Of course there are always exceptions but in the world of aftermarket performance turbos this is a good approach. In the Garrett family that would mean choosing a GT3071R vs. a GT2871R (both have 71mm compressor wheel), or as a larger example, choosing a GTX3576R over a GTX3076R (both share the same 76mm compressor). Sorry about that. I honestly felt bad not getting a GT after all the advice you shared, but price is a factor, and there didn't seem to be a way to get such modern tech (in the wheels, not the CHRA of course) at a low price point with Garrett. I remembered you saying that about the compressor size vs. turbine size, and the BW compressor and turbine are almost the same exact size. Why do so many of the other aftermarket turbos have such large compressors compared to their turbines? The GTW series might have met your criteria for lower cost with good aero but an older platform design. Not sure if those are widely known in enthusiast circles because I don't see much chatter about them. They share some parts with older T3/T4 turbos but have modernized compressor aero; there is also a choice between journal bearing & ball bearing. The turbine/compressor mismatch is a longstanding trend with roots in historical misunderstandings or oversimplifications. I think it started when customers/tuner shops/distributors started asking for more compressor airflow capability to support higher power. But they were concerned about increasing turbine wheel size because of the measurable increase in turbine mass & inertia, and perceived increase in lag or response time. It got a bit out of control with certain turbos that were extremely mis-matched in order to meet this customer demand or request. As in, compressor wheel exducer diameter being 1.4x turbine wheel inducer diameter. When I was involved in creating new GTX combinations we started focusing on reversing that trend, with the ideal sweet spot for compressor exducer around 1.1x turbine inducer. the ideal sweet spot for compressor exducer around 1.1x turbine inducer. Giving out the old trade secrets eh? I can't believe I never looked at the GTW series more closely. I think I did initially, but the smallest compressor I saw was around 56mm, and I was scared off. Regarding the ideal 1.1:1 compressor/turbine ratio, how does the smaller end of each wheel play into it? Nah, just my own observations from experience and from talking with end users. The smaller diameter of each wheel determines trim and tweaks air flow. These are the diameters people like to talk about since they are the ones that are easily seen and measured with a complete turbo in your hands. They don't factor into the speed match much at all, except at the very edges of the performance window (near choke flow for example). The speed match is all about speed at the tip of the wheel, so the largest diameter for each. As you scale a wheel up or down you affect flow and speed simultaneously. Changing trim via the smaller diameter lets you adjust flow without affecting speed. Add :large to the URLs for higher res. Yup, I got the MVS and it's a really nice piece. No one actually uses the water cooling though, right? Bought a Homergate. valve stem seized right on the guide. Replaced with an MV-S and did do watercooling; just a loop teed into the turbo coolant lines. I've been trying to take care of some nagging issues before I do the Coastal Range Rally in a couple weeks. Issue number one was drivetrain NVH. I pulled the transmission again and measured the bellhousing runout. It was way out of spec. Almost .015, which is 3 times the Tremec recommended .005. I expected this, since the only thing that locates the DeeWorks adapter is the four bolts that hold it to the bell housing. I adjusted it by leaving the four bolts slightly loose, then tapping the adapter around with a mallet until it was within spec. I ended up with around .002 runout. Then I pulled the bellhousing, tightened the bolts, and had dowels pressed through the adapter and into the bellhousing. I also had the machine shop flycut the transmission mounting surface, because it had significant warp and was close to .020 from being coplanar to the block mounting surface. While it was out, I measured the input shaft endplay and found the bearings had settled. It had about .004 endplay, when it's supposed to be zero. A .005 shim was all I had, so now it's got a bit of preload. I also went back to the stock T5z shifter, in hopes that it would feel a bit less mechanical than the eBay one I was using. Hopefully that, along with the 400g shift knob smooths out the shifts a bit. The crossmember finally got some black paint, a speed sensor went on, and the T5 went back in, filled with Pennzoil Synchromesh. 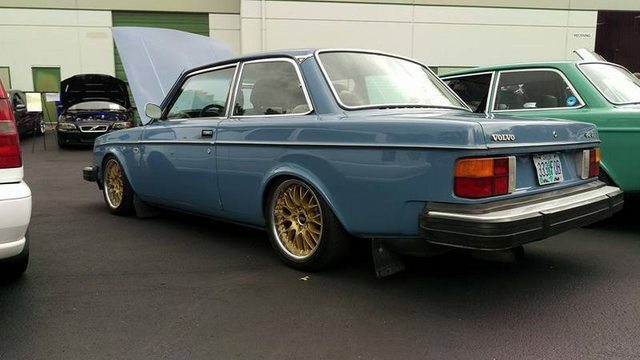 Driveline vibes are annoying on this car, just like everyone else with a T5. I wanted to do everything I could to address them. I got an Aerostar yoke, and it BARELY fits in the tunnel. I thought I heard it rub once or twice on my 10 minute drive today, but I'm not sure. Another big problem with the early 140 is the small drive line tunnel and the really soft center bearing bushing. I found a Spicer one, similar to what Gary has used in his wagon, but this one is slightly smaller. Trimmed the corners off and it fits perfectly in the stock tunnel. Ideally, I'd make something adjustable, but that would require an even smaller OD bushing. So that's where the car is now. I took it for a drive earlier, and it died on me. I think the battery has been run too low too many times. Unfortunately, before it died, I found it had a much worse drive shaft vibration than ever before. At 40 mph, it's un-drivable. Obviously, it has to be either the center bearing or the Aerostar yoke. I marked the two halves of the shaft before pulling it apart, and the u-joints are in phase. The new yoke seems to have a bit of tail shaft bushing play, possibly because it's shorter. It measured out exactly the same as the last one. Another weird thing is that the slip joint at the center bearing (stock 140 drive shaft) seems to have more play than I noticed before. I'm wondering if the play was always there, but the old center bearing bushing soaked up the vibes from it. I'm going to try to swap the old bearing/bushing in and go from there. Sorry for your luck with the driveline vibes. I will say that I had almost the same experience as you did when I added the Spicer center carrier and Aerostar yoke to a 2pc driveshaft in my 242...un-driveable. Idk if the center carrier wasn't seated correctly or what...never took the time to 100% diagnose that, but the Aerostar yoke works well on a 1pc driveshaft.